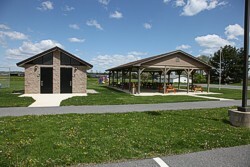 Forks Township has many parks and recreational areas for your enjoyment. 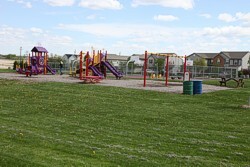 To view a location map of parks click here. Community Park is a 52 acre park located west of the Township municipal complex accessible from Zucksville Road at the north end and Marigold Drive from the south. 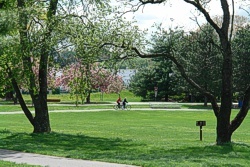 Community Park is a place for members of the community to meet and to develop relationships while attending a sporting event, walking the path, or eating lunch at one of the picnic tables. A restored log cabin, original to Forks Township, is situated on the northern end of the park complex, and is open to the public during the annual Community Days. 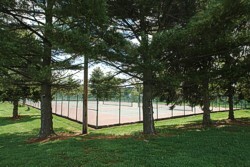 The park offers both active and passive recreational activities to refresh the mind and the body: a walking path, 9/10 of a mile, encompasses the park, with a fitness walk (ten exercise stations); four tennis courts and a basketball court; and benches for reading, people-watching, or enjoying the sounds of the community. 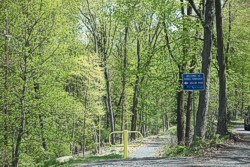 Lions Park is located on Bushkill Drive bordering the Bushkill Creek, and so named after the Forks Lions Club. 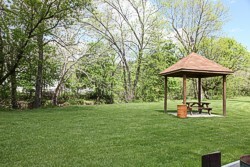 This park, comprised of two small tracts separated by a wild meadow, provides the community with a quiet area to enjoy the beauty of the Bushkill Creek and to commune with nature. 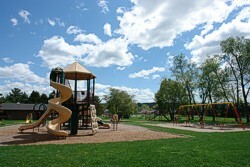 A neighborhood park located within the Penn's Ridge development off Newlins Road West, Penn's Ridge Park offers a two basketball courts as well as a tot lot for children. Located on Sullivan Trail two miles north of the municipal complex, adjacent to Braden Airpark, Braden Airport Park is comprised of 23 acres. 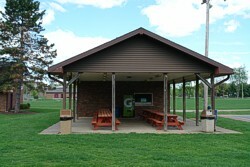 This park is a good place to gather with friends and family for picnics, parties, or celebrations under the pavilion (available for a fee). Vista Drive Park, a neighborhood park located in the Vista Estates development off Richmond Road, is 1.9 acres and is comprised mostly of a baseball field. 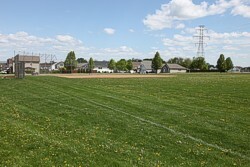 This field is used by the Forks Township Youth Sports Organization during spring months; however, is available to the public when not in use by youth sports (as with all Township sports fields, this field is closed during winter months). 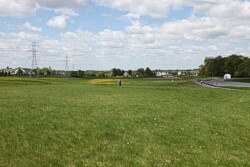 A walking path traverses the baseball field, linking the Meco Fields walking path to the west. This sports complex is located between Meco and Richmond Roads, accessible through the Frost Hollow West development. The fields are for organized sports during lacrosse, baseball, field hockey, and soccer seasons, through the Forks Township Youth Sports Organization. A walking path traverses the fields linking the complex with the Vista Estates walking path across Richmond Road. Located on Paxinosa Road East, at the southeastern end of Forks Township, Gollub Park is a nature and preserve trail offering spectacular views of the Delaware River. Both hiking and walking can be accomplished on this rugged trail which provides the nature enthusiast with a wonderful experience of sight and sound. Situated in Riverview Estates across from the community clubhouse on Winchester Drive, this hard-packed dirt and grass pathway provides all naturists with a lush rail-trail experience. A saunter along the trail surrounds you with wooded areas, open fields, and craggy cliffs overlooking the Delaware River. The trail winds 1.3 miles north and is perfect for outdoor enthusiasts of all ages. This trail is open to the public from sunrise to sunset. CLICK HERE for Two Rivers Trail Map.